After being gone for almost half of 2015 out of the country, I discovered some of the coolest iphone apps that made traveling that much easier! I had a very limited data plan, so always had to be careful with that, but if you study abroad you’ll discover that most places have free wifi for guests (city centers, restaurants, stores, etc.). I really used my phone a whole lot less while I was overseas. While it takes some time getting used to, it’s kind of nice to be disconnected (to an extent, remember to call your parents often, they worry!!) from the reality of everything back home. I learned how rejuvenating it can be to focus on traveling and everything there. With all that being said, there are some great apps for your phone that can really make traveling easier! WhatsApp // While you may always be able to iMessage on wifi (without an international plan) to people who have iphones back home, what about people who don't have iphones and can't iMessage? WhatsApp is what I used while abroad and it worked great for people who don't have iphones! My aunt has an Android and was able to download it and we texted through that! Google Maps // Just my personal favorite for direction. Getting lost can be a good thing in a foreign city, but when you're on a tight timeline and you're trying to hit all the sites, it's important to know where you're going so you don't waste time being lost! Rail Planner // Your guide to European trains! It's so easy to travel around Europe by train and often times more enjoyable and cheaper than a flight! This app can be helpful for schedule, train times, etc! City Maps 2Go // Must have app. This app allows you to download a detailed map of the city while you're on wifi to use while you're touring! After you have it downloaded it can use GPS without using data or wifi and show you exactly where you are! LIFE SAVER. CityMapper // I used this app religiously in Paris this past summer. I had programmed work and my dorm into it and with the click of a button it could tell me the fastest way home! It gives you detailed and easy directions home via bus, metro, or foot! It also tells you how long until the next train and where the closest stop is located. In Paris, I never had signal while on the metro so make sure you screenshot the directions before you walk down into the metro and don't have signal! Skyscanner // Compares all the websites and helps you find the cheapest flights! I used Skyscanner to book all my flights flights abroad! Hostelworld // Easily find the nicest/ cheapest hostels in the city you're headed and read reviews from past guests! While you can book your hostel through hostelworld through the website, having the app is super helpful to have all your information about your stay, the address, and phone number in your phone at all times! Travel Safe // It's super important to always be aware of your surroundings at all time while traveling (abroad or domestic!). Travel Safe holds all emergency contact numbers (like the US embassy phone number and address) for countries all over the world. No need to waste time googling the info! Google Translate // Although there are tons of translator apps, I personally like the Google one the best! It has a feature where you hold your phone up and using the camera you point at something in another language and it tells you what it says in English! Great for Menus! 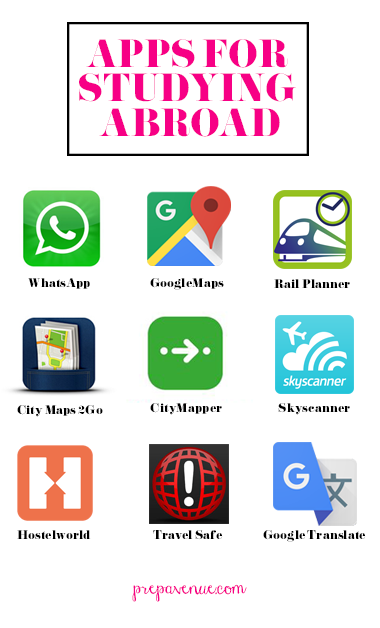 Do you ever have any favorite apps that you used while traveling? Let me know, I'm super curious!